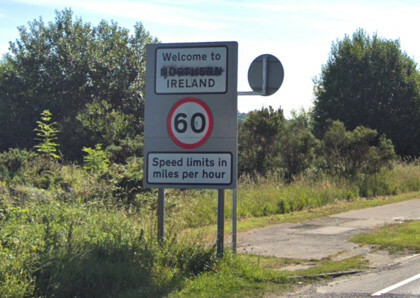 Irish Backstop? Enjoy the Dublin Racing Festival Instead! It’s been a pretty good week for Theresa May, by all accounts. Her bodged attempts at securing a Brexit deal have been swept under the carpet now that she has been given permission by the House of Commons to seek a better exit package, and the Prime Minister now has time on her side as she seeks to eradicate the damned Irish backstop, amongst other things. It may cost the humble British taxpayer a whole bunch extra to get us out in what will essentially be a bribe to EU negotiators, but hey: that’s democracy in action. Speaking of Ireland, there’s a cracking card of racing across the water this weekend. 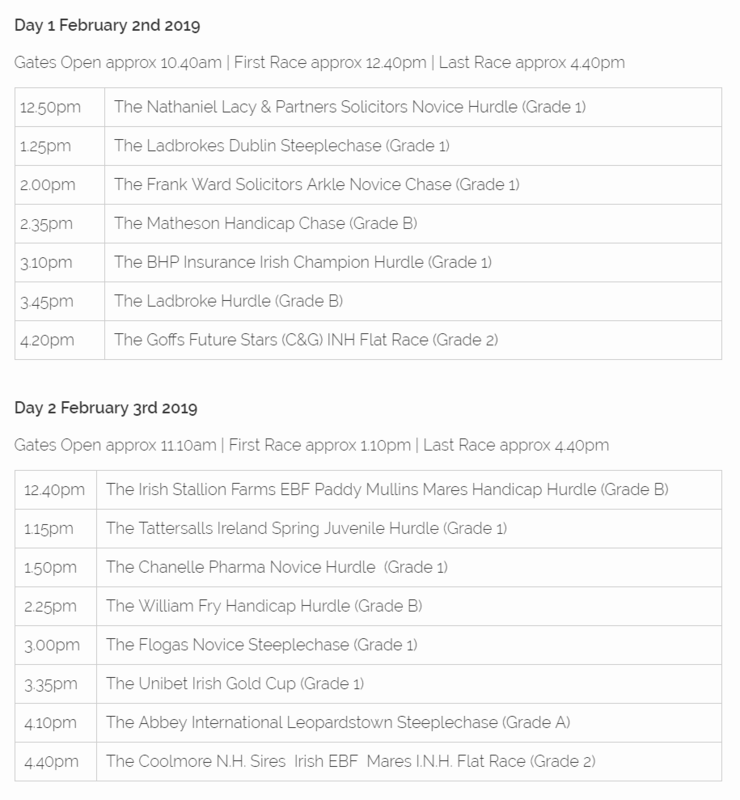 The Dublin Racing Festival takes place at Leopardstown on Saturday and Sunday, and with punters’ attention turning to the Cheltenham Festival, which again will kick off in mid-March, the weekend’s action acts as a fantastic waypoint ahead of that magnificent meeting. The stacked card features no less than eight Group One encounters, with nearly €2 million in prize money set to be dished out over the course of the weekend. As importantly, we will all be able to mark our cards ahead of the Cheltenham Festival for the horses that can be filed, from a betting perspective, under definite, maybe and don’t touch with a rather large bargepole. It’s particularly cold across the UK and Ireland right now, as many readers will be aware, but the good news is that the temperatures are set to rise – ever so slightly – ahead of the weekend, which should ensure the meeting goes ahead as planned. The going will be good, you would imagine, and that will lend itself to some top quality racing on the famous Leopardstown track. For my money, there are three main races to focus our attention on: Saturday’s Dublin Chase and Irish Champion Hurdle, and Sunday’s Irish Gold Cup. For those who have followed his career so far, Min is the kind of quality operator that it’s surprising he hasn’t made more of a major impact on the showcase races. The eight-year-old has won well twice at Leopardstown, mind you, including the Racing Post Novice Chase and this very race 12 months ago, where he streaked home by a whopping dozen lengths from Simply Ned. 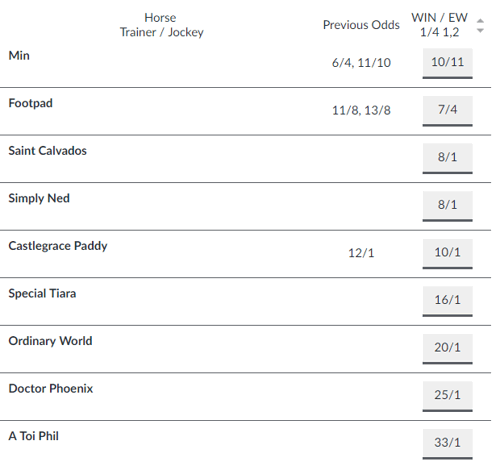 A decent win on his seasonal debut at Punchestown last time out affirms the message that Min is a canny operator, and he looks to be a decent punt to successfully defend his title here. Willie Mullins’ charge will be up against a field containing his stablemate Footpad, who may also be a challenger to his authority in the Ryanair Chase at the Cheltenham Festival. It’s been an indifferent time for the seven-year-old since his flying win at last year’s festival, in which he powered home at the Arkle. Footpad may have powered home in April’s Ryanair Novice Chase, but his step up to the big time has been fraught with errors. A fall at Naas in November set tongues wagging, before a narrow defeat as an even money favourite at Leopardstown in December continued the narrative. 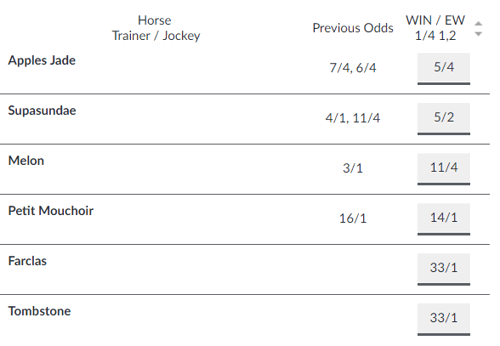 One of this pair should win the Dublin Chase, and you can expect them to collide at Cheltenham too. For now, Min appears to be the safer bet. The Cheltenham Festival has been a source of good and bad times in equal measure for Gordon Elliott as far as his horse Apple’s Jade is concerned. A narrow defeat in the JCB Triumph Hurdle was followed by victory in the Mares’ Hurdle a year later, but on heavy ground the 1/2 ‘dead cert’ lost in the same race 12 months later to Benie De Dieux. Revenge could well be a dish best served on good ground, on which the mare really thrives. She’s a strong fancy on Saturday after winning three times on the spin this season, including a classy display in the Christmas Hurdle and a 20-length triumph in the Hatton’s Grace Hurdle, in which she demolished the Irish Champion Hurdle second favourite, Supasundae. 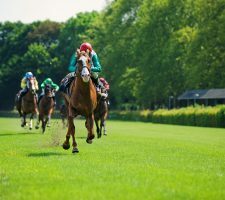 The quicker ground clearly suits the seven-year-old, and at 5/4 she is a fantastic bet to land the big one on Saturday. Punters with long memories will recall Road to Respect’s excellent victory in the Leopardstown Christmas Hurdle back in 2017. There have been plenty of other good days for the eight-year-old, but a disinterested run in the Savills Chase back in December has left many students of the game putting a black mark next to his name. 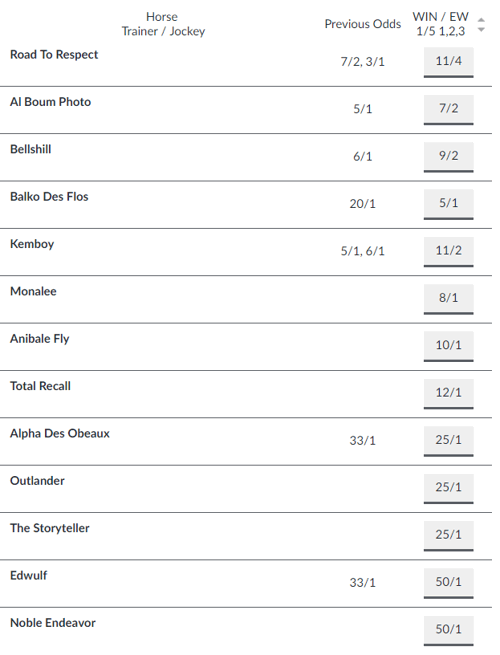 The winner that day was Kemboy, a pacey seven-year-old who looks to have a fair chance in this, the Irish Gold Cup, despite being relatively written off at 11/2. He’s more favoured than Al Boum Photo, the 7/2 shot, who prefers a mudbath than a skating rink. Another who won’t fancy the quicker conditions is Bellshill, who deserves respect for winning the Punchestown Gold Cup last year. But remember, Willie Mullins entered him into the Irish Grand National too, which offers a glimpse as to where he thinks the horse’s best work is done. It’s a fascinating renewal, and it will be interesting to see if Kemboy can serve up something of a shock victory. 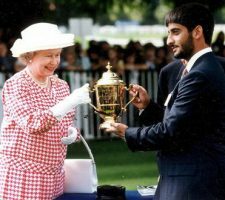 From Bore to Ebor: Forget Boris, Let’s Enjoy Some Racing!